One of my favorite Robert Altman films is his ensemble piece, “Short Cuts”, which is a satisfying example of a how to successfully balance multiple storylines as they eventually intersect. It had been done before and would be done again. However you feel about Paul Haggis’ “Crash”, which also weaves multiple through characters, it safely walked away with multiple Oscars despite controversy. 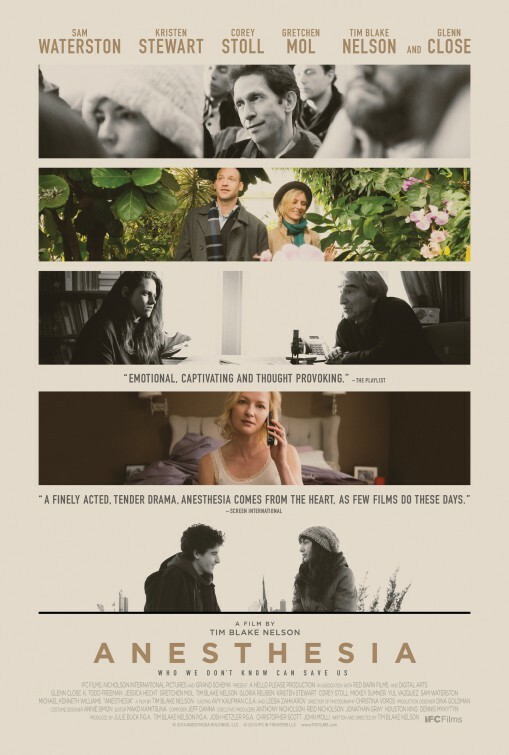 “Anesthesia” finds writer, director and co-star Tim Blake Nelson taking a crack at the subgenre with several flawed and philosophical characters who are, for the most part, lost and lonely – kind of like this movie. There’s a desperate search for meaning in Nelson’s film, as conveyed by characters who are weighed down by anger, misery or confusion, but once it starts it doesn’t take long for the film to feel like a boring slog with pretentious drama that feels like predictable made-for-cable (or Lifetime, for that matter) drivel. 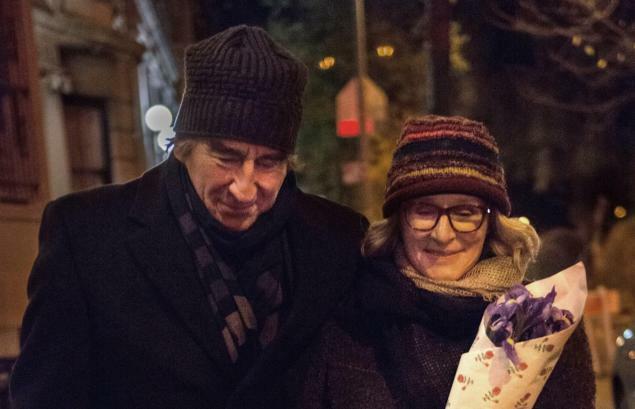 The film opens on a late Manhattan evening, where we follow a man named Walter (Sam Waterston) picking up some flowers for his wife, Marcia (Glenn Close). Nelson shoots from across the street, where we can see everyone in the frame and even hear a few lines here and there. It’s a scene that establishes placement, but there’s also a forced looming foreboding as well. Sure enough, we witness Walter getting mugged minutes later, desperately calling for help and eventually winding up in the arms of a stranger in a nearby apartment building, barely hanging on as medical assistance arrives. In “Anesthesia” though, no one is a stranger. The film backs up to reveal what led up to that unfortunate event with Walter. The stranger who helped Walter is Sam (Corey Stoll), who we’ll learn is having an affair. To explain his absence, he tells his suburban housewife, Sarah (Gretchen Mol), he’s working overseas, but she doesn’t buy it and medicates herelf with booze as she’s left to take care of their two young daughters. She can often be seen verbally spatting with another school mom (Natasha Gregson Wagner), who’s known for flipping off other moms. Meanwhile, Walter’s son, Adam (Tim Blake Nelson) is dealing with his wife, Jill’s (Jessica Hecht) sudden cancer diagnosis, which rattles their weed-obsessed teenagers, Hal (Ben Konigsberg) and Ella (Hannah Marks). The there’s Sophie (Kristen Stewart), a gifted-yet-troubled philosophy student of Walter’s at Columbia University, who turns to self-inflicting pain in order to achieve any sense of feeling in her confused and unstable state. Finally, we have Jeffrey (Michael K. Williams), a lawyer who tries to help his crackhead childhood friend, Joe (K. Todd Freeman), by checking him into a a psych ward for detox and evaluation. Obviously, there’s a lot going on here – in fact, there’s too much going in “Anesthesia”. Making an ensemble drama not seem trite or forced is hard and intersecting storylines can feel way to coincidental, both of which happens here. Nelson’s story is populated with characters that feel like either gross stereotypes or ones that ramble on and on about nothing ultimately. There’s a scene set in Walter’s classroom where he goes on and on about philosophical analysis and the perspectives of life, but it just comes across like a bunch of malarky. It doesn’t help that we know Walter will eventually be accosted, taking away any suspense viewers could have for the future of these characters, leaving them just to see how everyone conveniently bumps into each other in one of the heaviest populated cities in the nation. Nelson is too busy touching on beats of hardship that friends and family encounter in their lives, never really leading to any sobering revelations or moments of hope or enlightenment. It shouldn’t take long for viewers to figure out the meaning behind the film’s title – people numb themselves from their reality. See how easy that was? I’m sorry if it sounds like I’m rolling my eyes at all this, but it all comes across as so obvious. I want to work, just a little to figure out where these characters come from, why they’ve arrived where they’re at and how they’re going to get out it. These characters are smothered by their own failures, doubts, uncertainties and fears – something that is quite universal, but what Nelson and his cast delivers is flat and stifling anything that feels natural and authentic. It all feels too rehearsed and staged. The problem with multiple storylines with an ensemble cast is keeping all the storylines compelling, which relies on solid writing and directing, none of which is present here. It doesn’t help that there are more bland or flat-out bad performances here that border on public service announcements. Despite delivering some great recent performances, Kristen Stewart vacillates from pouty to tearful expressions for her struggling character, casting away any and all nuance. (It doesn’t help that the gobbilty-gook lines Nelson gives her similar to a painful after school special breakdown. The only standout performance is Freeman as a drug addict who doesn’t have the strength to change his ways, but even then, some of his dialogue is really forced. “Anesthesia” has one of the worst endings I’ve seen in a while. It’s not really a surprise it’s a letdown, since most of the movie is, it’s just unsatisfying, leaving us to shrug instead of ponder life’s miseries. I believe this to be one of the top most moving films I have encountered in my life. So very simple in it’s depiction of modern families and the bits of drama within each, the writer used bits and pieces of philosophy to paint such vivid and bold brush strokes that run from the first until the last scene that make this a stand out movie. Sam Waterson’s smiles and his obvious love and appreciation for life made it easy to let him wax philosophical about life and where it may or may not be taking us. This was my second ride through this movie and I quickly remembered that I had enjoyued this trip the first time around but was not certain why. At the end of this second go around I knew I had to make a comment if for no other reason than to be certain this movie is planted into my psyche as one of the very best in my life.